You'll experience the finest in luxury living at Camden Yorktown. Our one, two and three bedroom apartment homes come complete with spacious floor plans and an array of designer features. You're sure to enjoy our garden tubs, large kitchens, and bathrooms, wood-style flooring, premium cabinetry and brushed nickel fixtures. Our pet-friendly community offers several amenities for the whole family; from a private Dog Park for our four-legged residents to a beach-style pool with tanning shelf, outdoor grilling stations, business center, and a 24-hour fitness center with cardio, free weights, and circuit training. Inside the leasing center you'll find complimentary WiFi access, comfortable seating, a billiards table, flat-screen TV, and fully equipped kitchen perfect for planning parties. Residents receive a technology package included total monthly rent with a savings of up to 52% off retail. This money-saving package includes high-speed internet up to 150 Mbps and over 140 digital video channels through Xfinity. Use the Xfinity Go app on your smartphone or tablet to access your digital video anywhere! Situated in the heart of the Energy Corridor, our prime location features direct access to Beltway 8 and 290, as well as the highly acclaimed Cypress-Fairbanks ISD. Not to mention we're only minutes away from Bear Creek Park, shopping at City Centre and Willowbrook Mall, Sam Houston Race Track and much more. 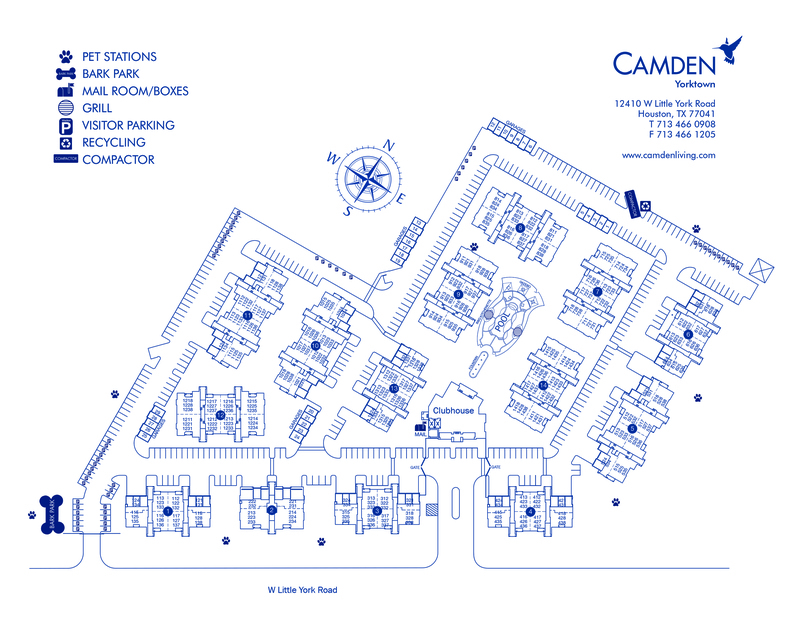 Come experience Living Excellence at Camden Yorktown. Garages and reserved spaces are ready for you to rent! $30 + tax per month for a reserved parking space; $115 per month for an attached garage; $105 per month for a detached garage.